"A wall is a very big weapon. It's one of the nastiest things you can hit someone with." 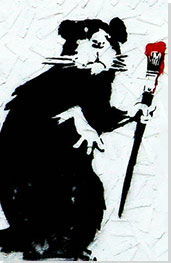 Because of the volatility and impermanence of Banksy's chosen canvas, i.e. the street and improvisational pop-up public places, he remains true to guerilla art's philosophy, being that the commodification of art is a blasphemous way to validate an artist within only a specific social sector or market. Anonymity has been Banksy's modus operandi, largely because it removes the status of artist as celebrity and instead forces a focus on the artwork. It also allows for the freedom of telling one's unapologetic truth without regard to consequence. In an ironic twist of fate, Banksy's subversive mien has only furthered his crossover to mainstream acceptance as the world takes note of his signature style and lack of any noted ego drive toward artistic recognition. The artist himself has become a bridge not unlike the ones his artwork aims to build. Whether Banksy is one person, or a group of people we don't know. But it is a fact that he (she, or it) has created some of the most powerful, controversial, witty, and brilliant contemporary art. In this iconic image, two (seemingly male) police officers in full, typical British uniforms are depicted kissing, in what appears to be a loving embrace. This work was originally spray-painted on the side of the Prince Albert pub in Trafalgar Street near the downtown core of the city of Brighton. Before its creation, one of Banksy's associates approached the pub owner on his behalf to seek permission for the work. The pub owner says, "My first thought was, 'oh no'. I thought we'd get in loads of trouble for it." But to his delight, after its creation, a group of uniformed officers appeared in front of the pub to view the piece and proceeded to take pictures. In 2011, the piece was replaced with a copy protected by a Perspex case, while the original was flown to the United States to be sold at auction. This work, now covered and protected by a Perspex overlay, features a man dressed up in what we associate with traditional riot gear, with a bandana obscuring his face, and his cap on back-to-front. His stance is one of a person about to lob a Molotov cocktail; he's taking aim and is ready to throw his weapon. However, instead of a weapon, he holds a bunch of flowers (which are the only part of the mural to appear in color.) This piece is located on a wall on the side of a garage in Jerusalem on the main road to Beit Sahour, Bethlehem. Again, Banksy has taken a pre-existing image - in this case an iconic photograph from Vietnam in 1972, of a girl - Kim Phuc - fleeing from a napalm attack on her village. The original photograph was taken by associated press photographer Nick Ut and has developed into a short hand for the atrocities of the Vietnam War. Banksy has isolated the image of the horror-stricken girl (originally surrounded by a few other clothed children and seven soldiers running down a road away from the site of the napalm attack) and flanked her with Mickey Mouse and Ronald McDonald. These two instantly recognizable, smiling characters, when juxtaposed with the image of Napalm Girl, give the image a very twisted and sinister feel. This work by Banksy refigures the iconic Impressionist painting Bridge Over a Pond of Water Lillies (1899) by Claude Monet. Monet's original reveals a tranquil scene of his own garden, with rich vegetation reflected in the calm water. Banksy has replicated Monet's original painting almost exactly, using the same materials as Monet, however Banksy has added two discarded shopping carts and a traffic cone to the pond. This mural depicts two young boys playing with buckets and shovels, like children creating sandcastles on a beach. The boys, one standing, the other kneeling, look back at the viewer, rendered in Banksy's typical black and white stencil aesthetic. Just above the boys, the artist has created the illusion of a broken section of the grey wall on which the mural was created. Through this false hole, a photorealistic color image of a tropical beach paradise is visible, with sand, water, and several palm trees. Banksy's spokeswoman Jo Brooks said that while Banksy was creating the piece, "The Israeli security forces did shoot in the air threateningly and there were quite a few guns pointed at him." However, Banksy questioned, "How illegal is it to vandalize a wall if the wall itself has been deemed unlawful by the International Court of Justice?" When painting these murals in 2005, Banksy had a conversation with a Palestinian man who told him, "You paint the wall, you make it look beautiful," to which Banksy replied, "Thanks." The Palestinian man then said, "We don't want it to be beautiful, we hate this wall, go home." This work on Newman Street in London was painted on the wall of a building used by the Royal Mail. At the bottom right, a child in a red hooded sweatshirt, black shorts, and a grey backpack, is seen painting the phrase "ONE NATION UNDER CCTV" while being watched by a police officer and a dog at the bottom left. In this work, Banksy plays upon one of the world's most famous paintings, The Mona Lisa (1503-4). Although in his piece, the female protagonist wears a headset while aiming a rocket launcher in his typical black and white stencil style. The piece first appeared in the Soho district of West London. This mural was created in May 2008 on Leake Street, London, as part of the Cans Festival. It depicts a maintenance worker in an orange vest in the act of pressure washing art off of a wall. The art appears to be ancient cave paintings of warriors and animals (horses, deer, and or bison), much like the famous discovery in the caves at Lascaux, France. This more recent Banksy work serves as an excellent example of the way that "guerrilla" street artists use the surrounding environment as an integral part of their works. In this work, Banksy has stenciled a simple black silhouette of a child with a large mallet in the process of striking something in front of him. The pre-existing object that the boy is about to hit is a red fire hydrant, which has a pipe coming up through the top leading directly to a round red object several feet higher (possibly a fire alarm). With the inclusion of the small boy with the mallet, this utilitarian plumbing fixture is instantly transformed to look like a "high striker" or "strength tester" (the classic carnival game where a player must use a mallet to hit a lever at the bottom of a tower, with the goal of launching a small puck upwards to hit the bell at the top of the tower). The piece is located on 79th Street, just east of Broadway, on Manhattan's Upper West Side. A local business owner and Banksy supporter installed a Plexiglas cover to protect the work.